Jordan started making a racket while still in junior high school. One of the band he formed with some friend's were known as those noisy, blues, stoner punks from Green Bay, Wi-the Mystery Girls. They had a good run releasing albums for Trickknee and In The Red as well as a handful of singles on labels such as Cass and Bancroft. 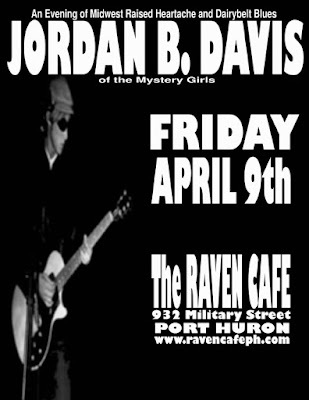 On Friday, April 9th at the Raven Cafe on in downtown Port Huron, Michigan he'll be showing his more Big Star/Gram Parsons singer/songwriter side with an acoustic performance. The plan is to turn the place into a hootenanny if only for one evening. It's all ages and no admission. Good drinks, decent eats and free Wi-Fi. What more could you ask for on an early Midwestern spring evening? Check out some of Jordan's latest music here.